Water-use data were aggregated for the 78 municipios of the Commonwealth of Puerto Rico for 2010. Five major offstream categories were considered: public-supply water withdrawals and deliveries, domestic and industrial self-supplied water use, crop-irrigation water use, and thermoelectric-power freshwater use. One instream water-use category also was compiled: power-generation instream water use (thermoelectric saline withdrawals and hydroelectric power). Freshwater withdrawals for offstream use from surface-water [606 million gallons per day (Mgal/d)] and groundwater (118 Mgal/d) sources in Puerto Rico were estimated at 724 million gallons per day. The largest amount of freshwater withdrawn was by public-supply water facilities estimated at 677 Mgal/d. Public-supply domestic water use was estimated at 206 Mgal/d. Fresh groundwater withdrawals by domestic self-supplied users were estimated at 2.41 Mgal/d. Industrial self-supplied withdrawals were estimated at 4.30 Mgal/d. Withdrawals for crop irrigation purposes were estimated at 38.2 Mgal/d, or approximately 5 percent of all offstream freshwater withdrawals. Instream freshwater withdrawals by hydroelectric facilities were estimated at 556 Mgal/d and saline instream surface-water withdrawals for cooling purposes by thermoelectric-power facilities was estimated at 2,262 Mgal/d. 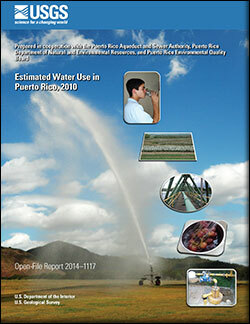 Molina-Rivera, W.L., Estimated water use in Puerto Rico, 2010: U.S. Geological Survey Open-File Report 2014–1117, 35 p., https://dx.doi.org/10.3133/ofr20141117.